Our transportation carriers and drivers have been certified to meet all new standards set by the North Carolina School Charter Transportation and Safety Committee (SCTSC). Also, we are listed as an approved vendor in the purchasing departments of many North Carolina school's, college's and universities. 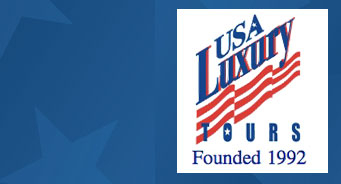 The motor coaches pictured on this page are acquired by USA Luxury Tours for chartered transportation and pre-arranged tours. Our objective is to exceed your travel expectations relative to quality, comfort, value and reliability. We make arrangements for you to travel on a luxury motor coach allowing a more pleasurable ride. These motor coaches are equipped with complimentary WiFi, DVD plays, CD players and AM/FM stereo for your listening and viewing pleasure. You will ride in comfort with seating capacity for ranging from a 28 minibus to a 57 passenger motor coach.